As well as overviewing some key research findings on contract cheating, this talk particularly focused on the issues facing online universities, such as the Open University within the UK. The slides, also available on SlideShare account for Thomas Lancaster, are included here. Is Finding The Answer To An Assignment Online Cheating? The question about whether finding the answer to an assignment online is cheating has come up on the forums for the Chronicle Of Higher Education. The answers given clearly believe that this is a form of cheating, although there are some interesting observations put forward, including relating this problem to contract cheating. One student suggests that they did just this, because they needed help with a problem, but acknowledged this to their instructor and received full marks. Of more concern is that assignments are still being set where the answer can be easily found online. This is encouraging students to cheat. Where a standard assignment is used, it makes it very difficult to monitor any contract cheating, as the same assignment will likely be traceable back to many different institutions. Some elements of uniqueness are needed. Whilst it is clear that academics often expect the best from their students, continued work on designing assessments that make both plagiarism and contract cheating difficult is necessary. 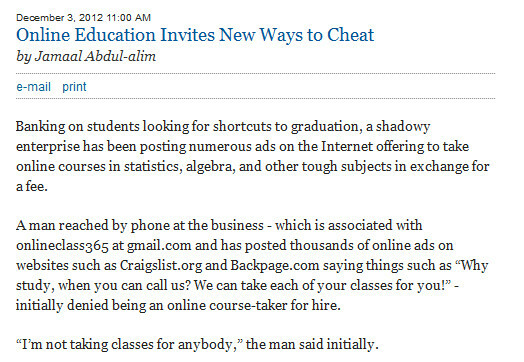 Washington Monthly reported on a particular issue related to contract cheating, where you can hire someone to take all your classes for you. This is an interesting discussion about the small ad classified websites which make it very easy to advertise contract cheating style services. In this case, cheating is facilitated since these qualifications are taken online, showing that the value of an online degree tends to be very low. There is a suggestion that some services may have IP address scanning mechanisms, however how foolproof these technical solutions are is open to question. The figures quoted to have someone take most modules, even where continued involvement with online discussions was needed, were low, running to just a few hundred dollars. That would make it seem like having someone else participate would be a good investment, particularly if the same person was involved throughout an entire degree course to not throw up any stylometric red flags. This is certainly another high tech cheating area worthy of further investigation and as the news article comments suggest, more innovative styles of assessments for these online courses need urgent development.